HFMI (High Frequency Mechanical Impact), also known as UIT (Ultrasonic Impact Treatment), is a high-frequency weld impact treatment designed to improve the fatigue resistance of welded structures. It is a cold mechanical treatment that involves striking the weld toe with a needle (or striker) to create an enlargement of its radius and to introduce residual compressive stresses. The new recommendation published by the IIW proposes a gain of 4 to 8 fatigue classes depending on the yield strength of the treated steels. The improvements actually noted in the study with our equipment show even more significant improvements. To know more about our ultrasonic impact treatment, download our flyer. 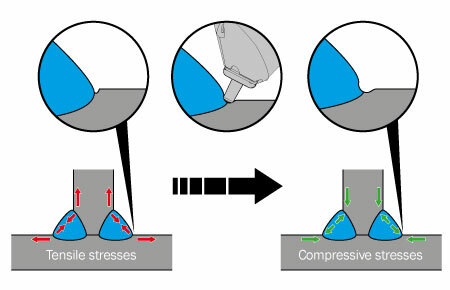 The creation of superficial compression, by peening, due to the impact of the needles on the material also makes it possible to improve the resistance for stress corrosion cracking. As this phenomenon occurs on structures and assemblies exposed to corrosive environments, the HFMI/UIT process helps to delay or even eliminate the appearance of cracks. The stresses created by welding processes cause distortions in the welds between the panels. These well-known distortions occur during the cooling phase of the weld, when the molten metal shrinks, resulting in plastic deformation of the welded metals. In order to eliminate tensile stress, conventional stress relieving processes are currently applied locally (heating, TIG dressing, etc.). These processes restore a stress level close to 0 MPa at the surface and at a depth but do not correct the defect created by the weld. 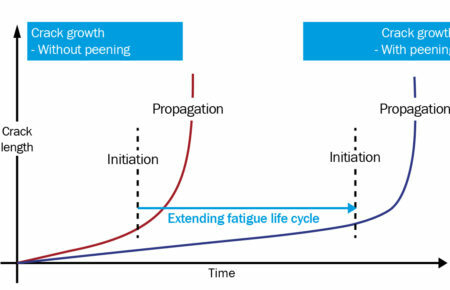 The ultrasonic shot peening (HFMI / UIT) process not only allows to create residual compressive stresses, which are much more beneficial than stress relief but also allows to straighten the deformations caused by welding. 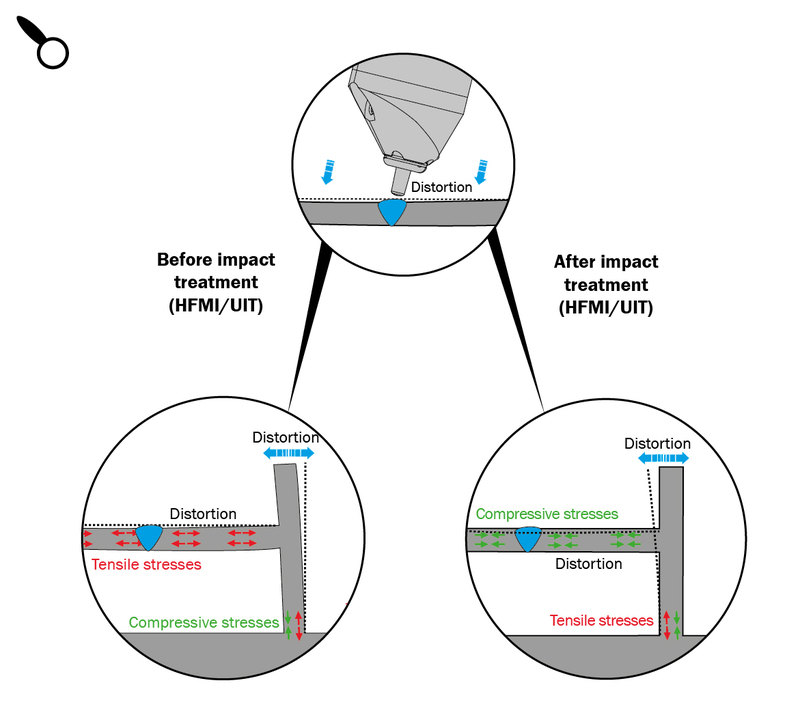 The 2 in 1 effect of ultrasonic impact treatment (HFMI / UIT) is particularly valuable when the aim is to improve the fatigue strength of steels, aluminium and other metal alloys while correcting geometrical defects. Fatigue resistance technologies, such as NOMAD (ultrasonic weld impact treatment equipment), are regularly and successfully used in many sectors: aerospace, energy, automotive, defence, transportation and infrastructure. When producing a part or making and assembling a structure, the first step in controlling fatigue resistance is to assess the most critical areas where cracks may appear. Then the best process to apply must be determined. The key to this choice is to assess whether a method of improving fatigue resistance is needed before the onset of major damage. A preventative rather than a corrective approach is much better in order to minimise costs and maximise profits. Ultrasonic impact treatment is one of the best preventive treatments to improve the fatigue resistance of welded structures.